He was shuffled out of his portfolio earlier this summer. Dominic LeBlanc speaks in the House of Commons on Dec. 8, 2015. 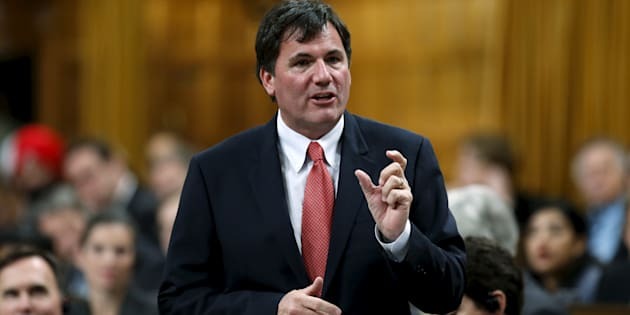 OTTAWA — Canada's federal ethics watchdog ruled today that Intergovernmental Affairs Minister Dominic LeBlanc violated the conflict of interest act when he approved an Arctic surf clam licence to a company employing a family member. Ethics Commissioner Mario Dion said in a report today that LeBlanc knew his wife's first cousin was involved in the Five Nations Clam Co. and would have benefited financially when he awarded the company a multi-million dollar license in February and should have recused himself from the decision. "If a public office holder is aware of a potential opportunity to further the private interests of a relative through the exercise of an official power, duty or function, the public office holder must be vigilant in avoiding such conflicts of interest." The decision comes less than two months after the government cancelled the decision and started the process over to award a fourth Arctic surf clam license to encourage Indigenous participation. Speaking to reporters in Saskatoon, where Liberal MPs are gathered for a caucus retreat, LeBlanc says he accepts Dion's findings "without reservation." "Canadians expect when mistakes are made that people assume those mistakes and, more importantly, commit to doing better in the future and that's exactly what I'm doing." However, he also qualified that Dion's ruling "confirms that no financial benefit was created in this circumstance and no preferential treatment was given." The deal to award a fourth fishing licence for Arctic surf clams would have ended a 19-year monopoly on the Arctic clam fishery held by Clearwater Seafoods and offered 25 per cent of the catch to local Indigenous communities. But it came under scrutiny after court documents suggested the company did not meet the federal government's initial eligibility requirements, and that the company had close ties to the federal Liberal party - including the family ties to LeBlanc, and also connections to one current and one former Liberal MP. New Fisheries Minister Jonathan Wilkinson said in August the licence cancellation had nothing to do with the ethics issue facing LeBlanc and that he didn't think LeBlanc had acted inappropriately. Court documents show LeBlanc awarded the licence to Five Nations in February despite knowing the bid didn't meet all the parameters of the tender. In his submissions to Dion, LeBlanc argued that he is not close with Theriault and that he did not believe Theriault's spousal ties would define him as a relative within the conflict of interest law. Dion disagreed with this, and also noted LeBlanc had met with Theriault prior to awarding the clam licence to Five Nations, during which time they discussed the issue. "The inclusion of Mr. Theriault's name in the proposal, while no doubt adding to its credibility due to his extensive involvement in the seafood industry and with First Nations in New Brunswick, should have put Mr. LeBlanc on notice of the existence of a potential conflict," Dion writes in his ruling. Will the PM put his friendship aside & act or will he simply offer excuses, deflect & blame others? Conservative MP Todd Doherty has long been critical of the Five Nations deal. In April he called for Dion to investigate the deal because of other ties between the Five Nations Company and the Liberal party. Five Nations partnered with Premium Seafoods, a non-Indigenous Nova Scotia company whose president is Edgar Samson, the brother of Nova Scotia Liberal MP Darrell Samson. A newly added Indigenous partner, NunatuKavut, is headed by former Liberal MP Todd Russell. Dion found that Doherty's request for a conflict investigation based on these ties did not meet the requirements of the conflict act. Three days later, Dion became aware of the family connection and launched his own investigation. In a tweet, NDP ethics critic Charlie Angus says the ruling is "a sad reminder that this government's ethical shortcuts are a real roadblock to reconciliation and sustainable development for Indigenous communities." Last year, then-commissioner Mary Dawson found Trudeau broke Canada's ethics laws over two all-expenses-paid family trips to a private island in the Bahamas owned by the Aga Khan. Trudeau was also forced to pay a $100 fine earlier this year for violating conflict rules after failing to disclosing a gift of sunglasses given to him in 2017 by P.E.I. Premier Wade MacLauchlan. Finance Minister Bill Morneau was also investigated by the ethics czar for sponsoring a bill that reformed Canadian pension regulations while he and his family members held shares in a pension administration firm. Morneau was cleared of conflict in that case.